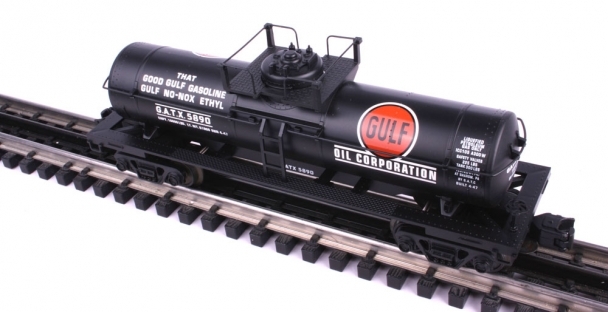 The gulf cars are among the most difficult Industrial Rail cars to find. These cars are sought after by not only model railroaders, but also by collectors of Gulf memorabilia. The gulf cars often command a higher resale price than other cars in the Industrial Rail line. 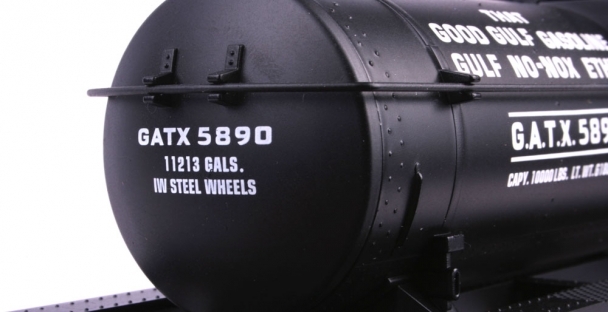 Unlike many of the series 6000 tank cars, this car has its road number printed on the frame. 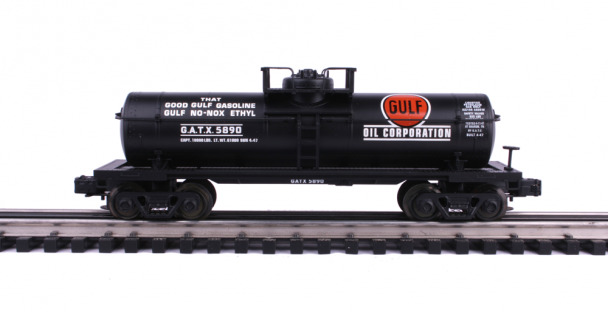 There is an error in the printing on all Industrial Rail Gulf Oil tank cars. In the car data a spelling error can be found "Sharon, PA" incorrectly spelled "Sharom". 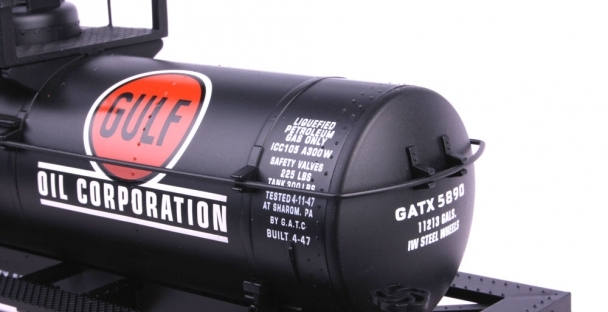 Until well into the 1970s, Gulf Oil sold distinctive brands of petrol/gasoline. One of these was the premium brand No-Nox Ethyl. 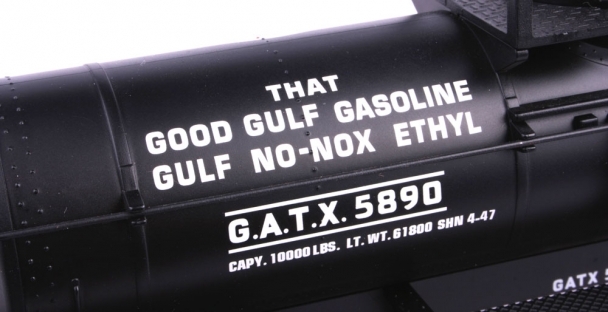 The slogan “That Good Gulf Gasoline” was a slogan used in advertising and promotion. This car references GATC Co. E. Chicago, IL. GATC, predecessor of GATX, was founded by Max Epstein in 1898 and a specialty rail car lessor under the name German-American Car Company. By 1907, with 360 tank cars and 73 refrigerator cars, the company was beginning to focus on tank cars leasing. That same year, it moved its repair facilities from Chicago, Illinois, to a larger site in East Chicago, Indiana. 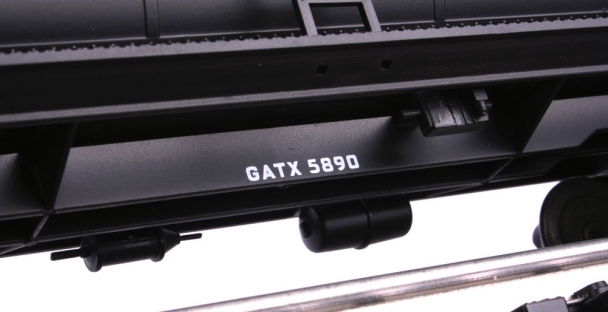 The company attracted customers by creating custom-designed cars for their products. Among its early specialty cars were chromium steel-lined cars to transport nitric acid; rubber-lined cars for phosphoric and muriatic acid; high pressure cars, which were developed in 1914; nickel-lined cars for transport of caustic substances; and air-tight cars for dry-ice transport. 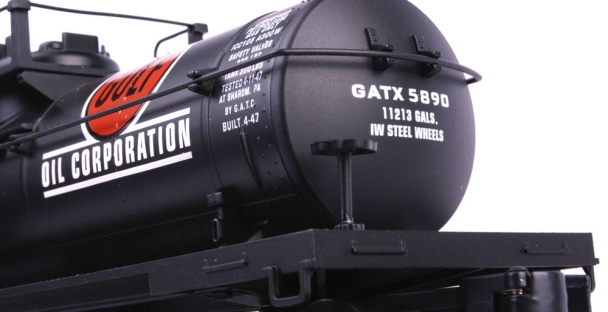 By 1916 the business merited a stock offering, and stock was listed under the name General American Tank Car Company (GATC), which served as a holding company for its subsidiaries.